However, commercial hydrogels do not stay put after being applied to the treatment area because of pressure from the body's movements and the flow of bodily fluids. Doctors therefore use special membranes to keep the hydrogel in place, yet those membranes are attached with sutures that perforate the very tissue the hydrogel is supposed to heal. "Our hydrogel is ten times more adhesive than currently available bioadhesives on the market such as fibrin," says Pioletti, head of the Laboratory of Biomechanical Orthopedics in EPFL's School of Engineering. "And thanks to its high water content, our hydrogel is very similar in nature to the natural tissue it's designed to heal." The new hydrogel is actually a composite material consisting of a double-network matrix and a fiber network. This structure preserves the material's strong adhesive capacity by blunting the impact of mechanical stresses. "The double network structure distributes incoming mechanical energy throughout the hydrogel, so that the material shows adhesion improvement when it is compressed or stretched," says Pioletti. "In hydrogels that lack these damping mechanisms, the mechanical stresses are concentrated on the interface between the hydrogel and the tissue, and the hydrogel comes off quite easily." Martin Broome, who heads the Oral and Maxillo-Facial Surgery Department at the University Hospital of Lausanne (CHUV) and is a co-author of the article, is convinced that this type of hydrogel could make a real difference. "If we build on the hydrogel's remarkable adhesive properties, that could open the door to a large number of potential applications. One day, for example, it might be used in place of metallic materials like titanium to set bone fractures. More immediately, we may no longer need to use complex sutures on some types of soft tissue." 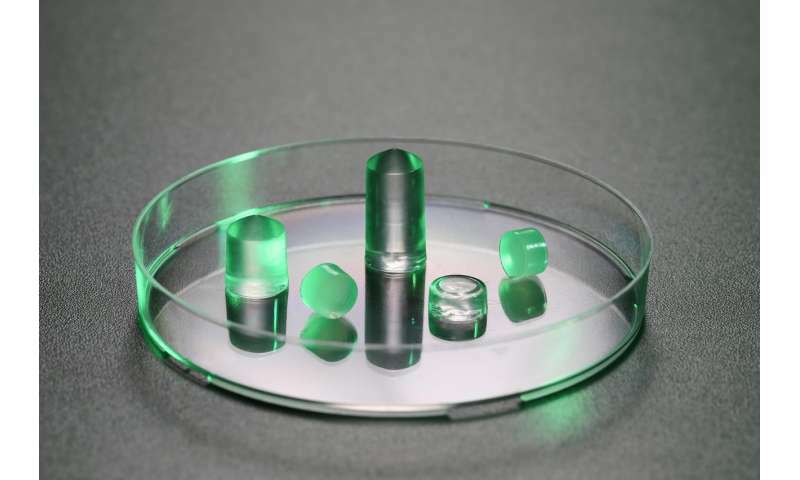 In its current form, the hydrogel developed at EPFL can adhere to several types of tissue. The next step for the researchers will be to tailor it to specific applications. "Now that our material has demonstrated its superior mechanical properties, we are going to work on loading it with different agents that could help heal a patient's cartilage or meniscus," concludes Pioletti.